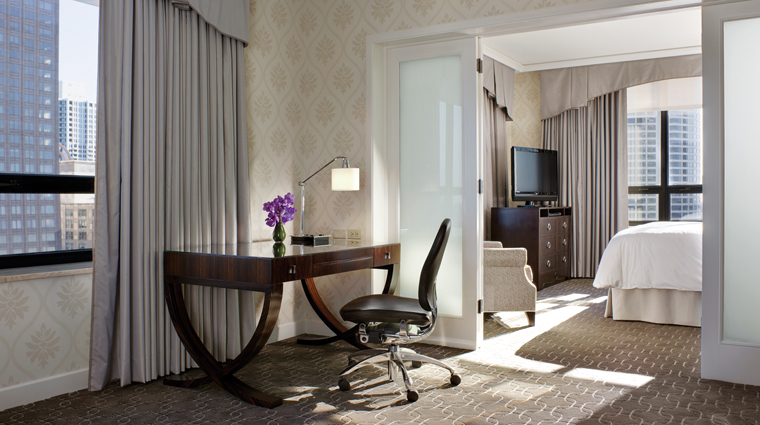 The Ritz-Carlton, Chicago's location in the center of the Magnificent Mile on the exclusive Gold Coast can’t be beat. Shopping mecca Water Tower Place houses the hotel as well as some of the best stores and restaurants in the city. Just an elevator ride down from the Four-Star hotel in Water Tower Place is an elegant shopping center with more than 125 stores. You can also walk out the door to find high-end shops like Chanel, Cartier and Bloomingdale’s — it’s a shopper’s dream. 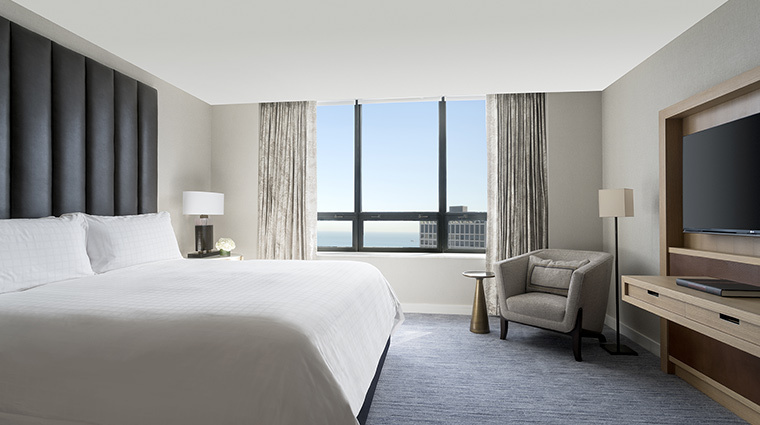 With some of the Windy City’s most prestigious shopping and fine dining at its feet, the luxury Chicago hotel is in the perfect location to enjoy the savviest sightseeing in the city. Spend an afternoon perusing works from Rembrandt, Van Gogh and Dalí at the nearby Art Institute of Chicago; walk across the street to see the historic Water Tower, one of a few structures to survive the Great Chicago Fire of 1871; or stroll over to popular Navy Pier along the lakefront. The recently updated fitness center has been expanded to 2,700 square feet and features top-of-the-line cardio and strength training equipment with motivational views of Navy Pier, Lake Michigan and downtown Chicago. 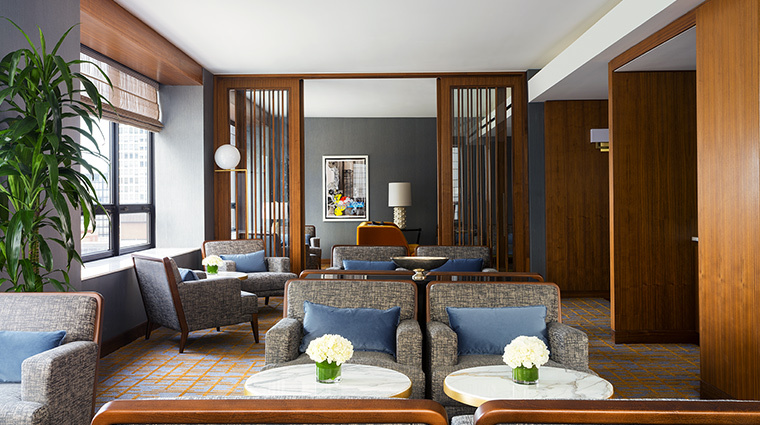 The Ritz-Carlton Club Lounge is a luxurious experience not to be missed. 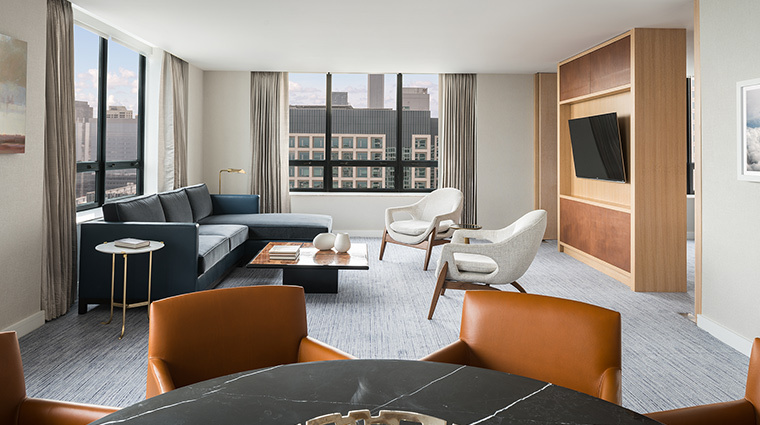 Enjoy exclusive access when you stay in a suite or club level room and receive five beverage and culinary presentations daily as well as dedicated concierge service. 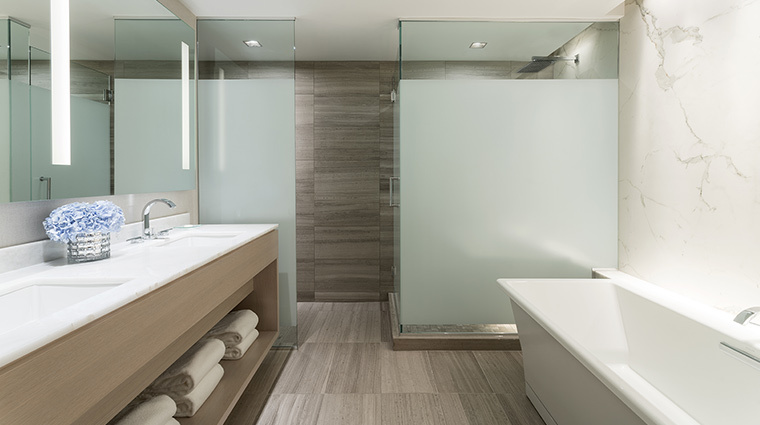 The eminently family-friendly hotel showers kids with perks. Children receive mini-sized robes, their own toiletries and also can partake in some spa services. Head for the serene spa, where you can indulge in treatments like the anti-aging yoga facial, which targets points on your face and neck to relieve tension. The atrium-enclosed swimming pool is the perfect place to take a dip or swim some laps regardless of the weather. Sign up for the rooftop yoga class, where you’ll do your downward dog on the 75th floor of the building and get amazing city vistas. The favorite kiddie amenity is probably the candy man, who rolls his cart around to let little ones choose from jars teeming with sugary sweets. Pets are welcome at the luxury Chicago hotel. Dogs and cats receive the VIP treatment, including a bed and water and food bowls. 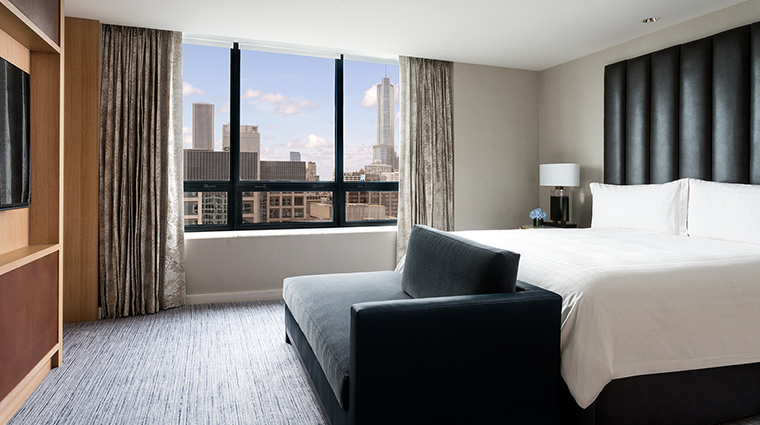 Along with big-picture windows featuring lake and city views, the light-filled accommodations come with elegant furnishings in silver and cornflower blue. You’ll have solid sleep in the comfortable beds, outfitted with fluffy duvets. 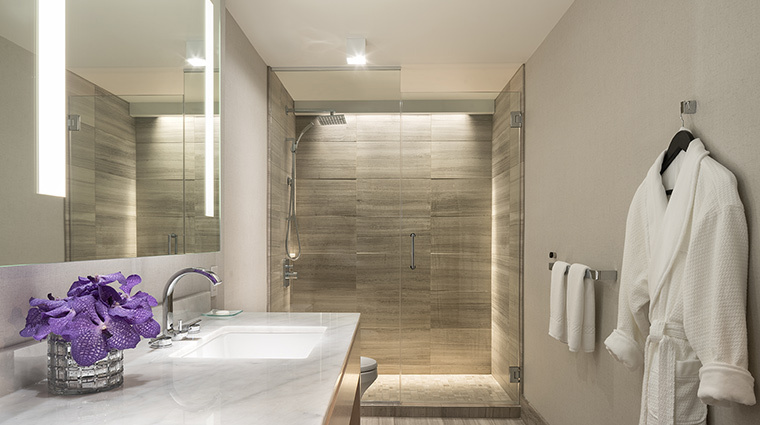 All accommodations feature marble bathrooms while the spacious suites offer deep soaking tubs, separate showers and Asprey bath products. 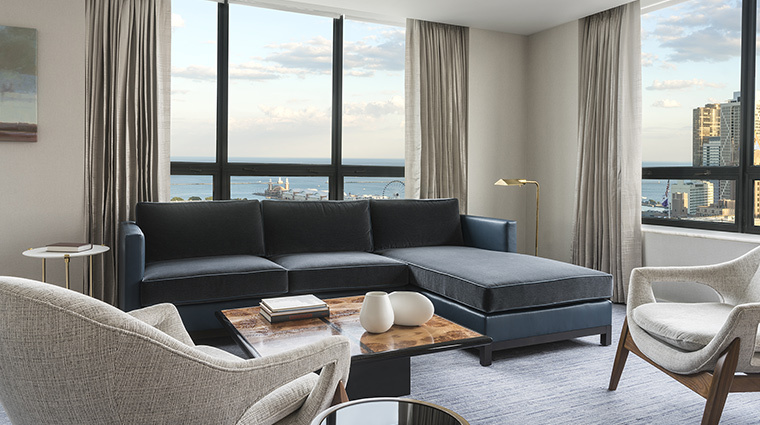 A variety of suites range in size and style to suit any need, from the 560 square foot Executive Suite all the way up to the 2900 square foot Presidential Suite. Deca Restaurant and Bar is located in the main lobby, making it a prime meeting point for hotel guests and Chicago’s elite. Head to the Art Deco dining room for updated brasserie fare like filet mignon with grilled asparagus and housemade fries, or choucroute garni au mer, a hearty dish of Norwegian cod, smoked cod, scallops, lobster sausage, bacon and sauerkraut. There’s no place like Chicago in the summertime, and hot rooftop bar The Dec is one of the best spots for handmade cocktails like El Diablo, made with Casamigos blanco tequila, ginger beer, crème de cassis and lemon. Another reason to visit the alfresco bar in the humid days of the summer is to cool off at the ice cream sundae cart.